Review by AllTheBestFights.com: 2015-07-12, some good exchanges between Michelle Waterson and Angela Magana but it is not enough to get three stars: it gets two. The black belt in karate Michelle Waterson entered this fight with a pro mma record of 12-4-0 (83% finishing rate) and she is ranked as the No.3 women’s atomweight in the world but she come off the loss against Herica Tiburcio (fight in which Waterson lost her Invicta Fc atomweight title, Waterson vs Tiburcio). Her opponent, Angela Magana, has an official record of 11-7-0 (73% finishing rate) and she comes off three consecutive defeats, the last one against Tecia Torres. 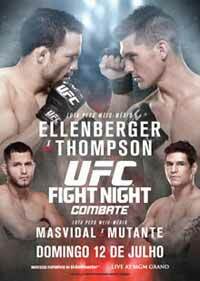 Waterson vs Magana is on the undercard of Jake Ellenberger vs Stephen Thompson – UFC TUF 21 Finale (American Top Team vs Blackzilians). Watch the video and rate this fight!